- With remarkable products like the popular K Series of powered speakers, QSC offers the very best in pro-audio innovation and sound quality. Call our Gear Experts now for help with your purchase: 800-460-8089. 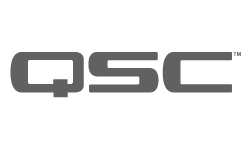 Founded over four decades ago, QSC is a globally recognized leader in the design and manufacture of professional audio system solutions. With power amplification, loudspeaker, digital signal processing (DSP) and digital mixer engineering resources all under one roof, QSC uniquely leverages these technologies to deliver products and systems that far outperform the sum of their parts -- providing compelling solutions for professional musicians, bands, DJs, houses of worship, music venues and more. QSC K Series powered loudspeakers are the industry standard in lightweight, portable, professional powered loudspeakers. The full-range K8, K10, and K12 each house an ultra-clean, powerful 1000-Watt QSC power amplifier in a rugged, lightweight enclosure with integrated DSP for ease of use and extremely high-fidelity performance. The KSub subwoofer is small and compact, yet packs a powerful 1000 Watts of low-end punch, extending the range of K8, K10 or K12 speakers for a complete PA system that defies its size. Whether you're a musician, band, DJ, house of worship, or anyone needing clear, powerful sound reinforcement in a compact footprint, the QSC K Series will wow you and your audience. Building on the success of the K Series, the KW Series from QSC represents the next evolutionary step in wood-enclosure loudspeakers. QSC system engineers created the KW Series to be smaller and significantly lighter than previous wood-enclosure models, while offering all the groundbreaking electronic attributes of the popular K Series. The KW Series includes three full-range models: KW122 (12" two-way), KW152 (15" two way), and KW153 (15" three-way), and the KW181 18” subwoofer, all tuned and matched to work together. The result? Amazing sound clarity, power and reliability for professional portable systems and sound reinforcement installations. QSC TouchMix compact digital mixers are designed for musicians, production professionals and live performance venues that need the power and capability of a large “concert” mixing console with an easy-to-use workflow, in a compact, affordable package. TouchMix-8 and TouchMix-16 mixers have the functionality to satisfy demanding professionals, combined with a range of features to help the less-experienced user achieve professional-quality results easily. New from $599.99 Only 2 Left! New from $799.99 Only 1 Left!